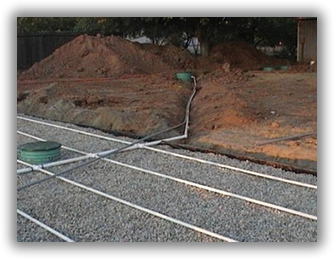 Septic systems are made up of 3 main componets. The septic tank does most of the work. Bacteria in intrduced in to the tank to digest the material introduced into the tank. The end products are water, gases, and the remaining undigested material (called sludge) that sinks to the bottom of the tank and the scum that floats to the top of the tank. The septic tank contains baffles that prevent any scum that floats to the surface and sludge that settles to the bottom from leaving the tank and therefore requires periodic maintenance of pumping the tank to remove it. The better the Bacteria performs the less oftern the tank will require pumping. The gasses generated are vented to the surface. The distribution box, controls the flow of a relatively clear liquid where it is then metered out to several perforated pipes. 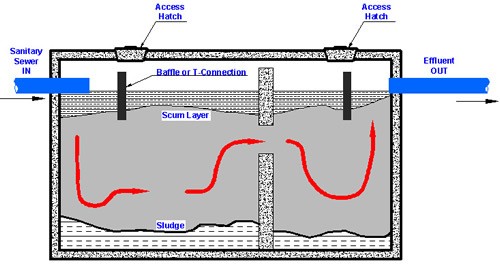 The leach field contains perforated pipes that deliver the liquid to a large soil surface area, called a leach field, or absorption field, for absorption. The soil also acts as a filter to remove any small amounts of solids that may be carried along with the liquid. 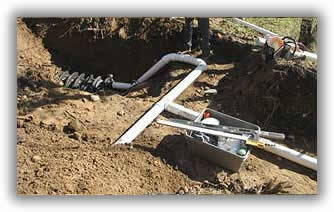 Septic System vary in size from small residential to large commercial systems. Bigg Dawg can handel any size system that is requred.